Beautifull 3 bedroom villa Laude, with great panoramic views of the Aegean sea! 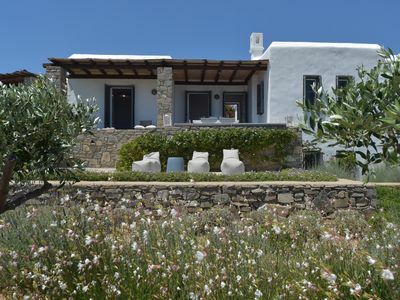 This beautiful Cycladic house is situated on the magnificent north-east coast of the island of Paros offering amazing views of the Aegean and the neighboring island of Naxos. The house sits on a 600 m2 plot in a small estate with 6 other houses all of similar size and share a common pool. The area is known for its swimming because it is protected from northerly winds and has close proximity to unique sandy beaches with crystal clear waters. The main town of Naousa with its shopping and dining options can be reached in just a few minutes by car. Villa Laude is a beautiful fully furnished house on a 600 m2 lot offering a total living area of 123 m² spread over two levels. The Ground floor offers a very generous master suite and a bathroom with shower. On the same floor, you will find the combined living and dining area with a modern fitted kitchen and all modern amenities needed to make your stay feel comfortable. From the living area, you have access to the shaded veranda and its outside dining table for 6 offering amazing views of the sea. Next to it there is a little balcony where you can sit and read or gaze at the Aegean Sea. Below that you will find a nice outside sitting lounge with sofas and from there a path which leads you to the swimming pool area where you can enjoy the sun and the surrounding views as it offers privacy and unobstructed views! The lower level offers 2 more bedrooms with large double beds, a bathroom with shower and one smaller room with a bunk bed for children. All of the living spaces are equipped with high-efficiency climate control system that ensures a perfect environment for both winter and summer. The property is accessed via two drives and offers shaded parking for 2 cars. This high-quality summer house offers modern comforts and an excellent location is a rare opportunity. In other words, a very cozy Cycladic house of the highest quality construction in a very attractive area for those who place value on comfort.